"I did attend the event," Harmeet Dhillon tweeted, "and witness the violence, shocked police stood by and did nothing." The vice chair of California's Republican party supported a rally on Monday at San Jose City Hall to demand answers to the violence that erupted at the Donald Trump rally last week. Harmeet Dhillon, who is a Trump backer and an attorney in San Jose, said she is in favor of a group called Silicon Valley Vet, who is asking San Jose Mayor Sam Liccardo how the Thursday rally got so out of hand. Trump's critics were seen as the main antagonists of the raucous behavior, which included egging, bruising and punches. Trump himself posted a strong statement criticizing the way Liccardo handled the situation, saying: "San Jose Mayor Sam Liccardo did a terrible job of ordering the protection of innocent people. The thugs were lucky supporters remained peaceful!" Dhillon, who said she will not personally attend the Monday event, said she was at the Trump rally outside the San Jose Convention Center and witnessed "the violence" and is "shocked police stood by and did nothing." The mayor, she said, "only made self-serving comments criticizing Trump, when thugs were attacking innocent people. Trump is not to blame for criminal behavior in San Jose." Liccardo spoke out against both camps last week, criticizing Trump for whipping up the nation with his “antagonistic” rhetoric, but also condemning anyone who quashed First Amendment rights with aggression. San Jose Police Chief Eddie Garcia said officers purposely hung back during the rally — and only intervened if they saw serious and physical trouble — so as not to further incite the crowd and be seen as an "occupying force." Still, there's an online petition spreading, calling for Liccardo to resign. As of Monday, 7,000 people had signed it. "I'm not terribly persuaded by calls for resignation from Plano, Texas," Liccardo said. The mayor concedes his initial statement after the melee could have been clearer in his condemnations of the violence, and he said there are undoubtedly lessons learned from the event to make sure the incident does not repeat itself. "What we saw was a violent situation from a few thugs," Liccardo said. "And we're going to do everything we can to follow up and make sure we make more arrests." San Jose police said Monday arrests are imminent in the aftermath of the melee, and are asking for victims and witnesses to step forward. The protesters in San Jose last week were not the typical leftie-Bernie Sanders supporters wearing Bierkenstocks and tie-dye T-shirts. The crowd comprised a mixture of people, but anecdotally, were predominantly made up of the city’s large first- and second-generation Mexicans. Some kept it peaceful, shouting “No hate in the 408,” referring to San Jose’s phone prefix. 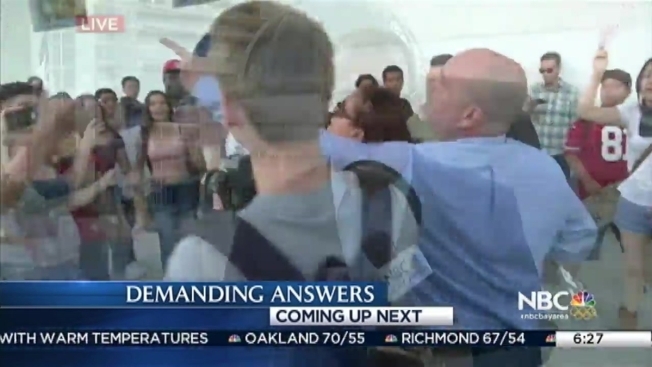 But others added the chant, “F___ Trump, F___Trump,” to their cries, contributing to the negative atmosphere, where some Mexican-Americans, such as 15-year-old Juan Castro, told NBC Bay Area that Trump fans were screaming racial epithets back at them. Specifically, the teen said, the woman who was egged outside a hotel where Trump was speaking was also using the F-word and saying things to him and his friends, like "You Mexican," he recounted. Video taken by San Jose State University students showed a young man spitting on her the moment after she was egged. That's when Trump critics, many of them the same people who were taunted, egged her, and also were seen jumping on cars, ripping off Trump hats and burning them. Many in the crowd didn’t specifically wear their political affiliations on their sleeves, other than to express a deep mistrust and disdain for Trump and his desire to build a wall and make Mexico pay for it. That’s what really set off some in the crowd, observers said.